Get your press release content published in PAID sites like Sbwire, PRBuzz, DatSyn, etc. Just provide me your Press release content and I will distribute to the best press release sites. Than I will build a 6 site linkwheel for you then ping all the web 2.0 sites. 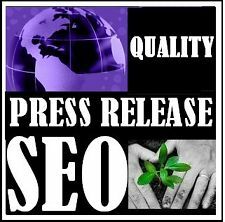 Manually submit your press release to 40 PAID and free PR site, and create SEO linkwheel is ranked 5 out of 5. Based on 15 user reviews.